The College has neatly designed, spacious rooms with latest Audio visual aids to provide a quality presentation. An excellent library having volumes of books, journals and magazines in the field of Nursing and other related fields are at the disposal of the students. Net facility has been provided for the use of students and faculty inorder to update their knowledge and be competitive. Well equipped modern laboratories in the department of Fundamental of Nursing, Anatomy and Physiology, Maternity and Child Health, Nutrition, Biochemistry, Community, AV aids, etc., are available to enable the students practice and master the skills perfectly. The College has a big computer lab with latest computers and internet facilities. College has its own tranportation for the use of students to attend clinicals and classes on time. 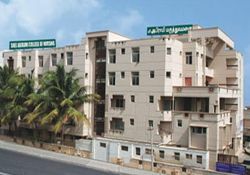 Affiliated to : The Tamilnadu Dr.M.G.R Medical University, Chennai. Recognised by : Tamilnadu Nurses and Midwives Council,Chennai.